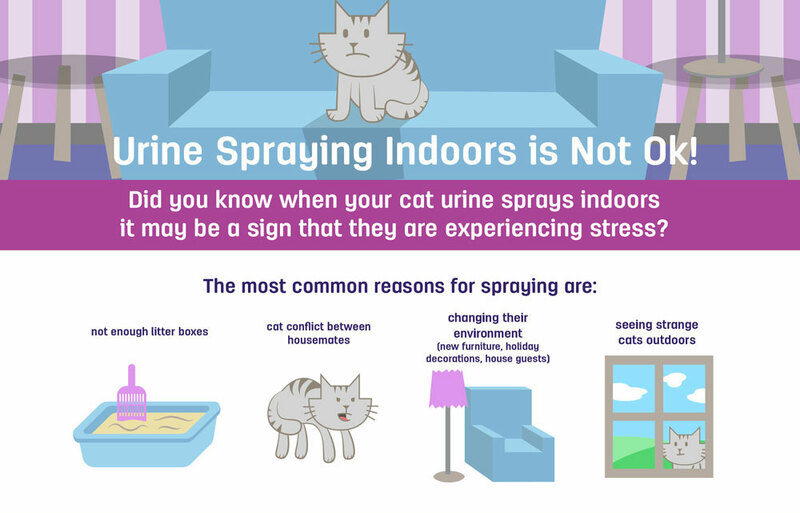 FELIWAY products are a clinically proven, drug-free solution to help alleviate many of the unwanted behaviors cat owners deal with. 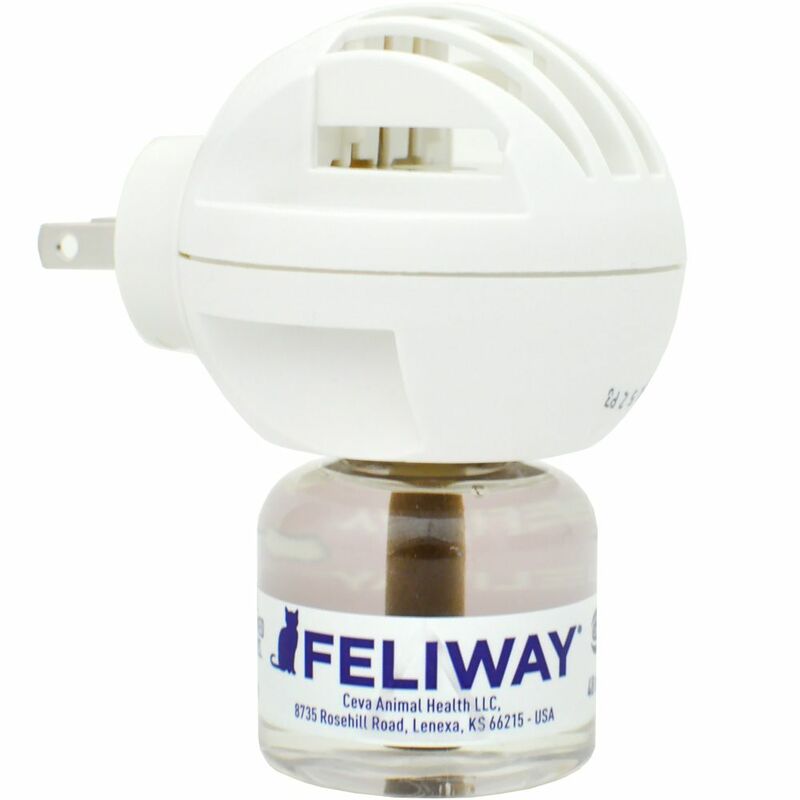 FELIWAY CLASSIC provides “happy messages” to cats and makes them feel calm and comfortable at home. 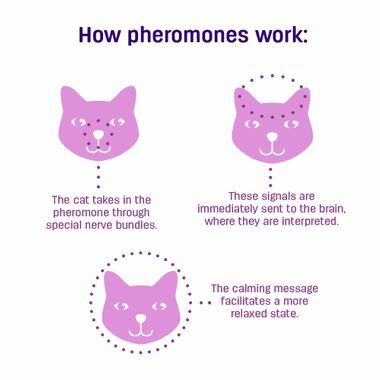 By mimicking the natural feline appeasing messages (pheromones), FELIWAY CLASSIC helps cats happily adjust to pace of modern life. 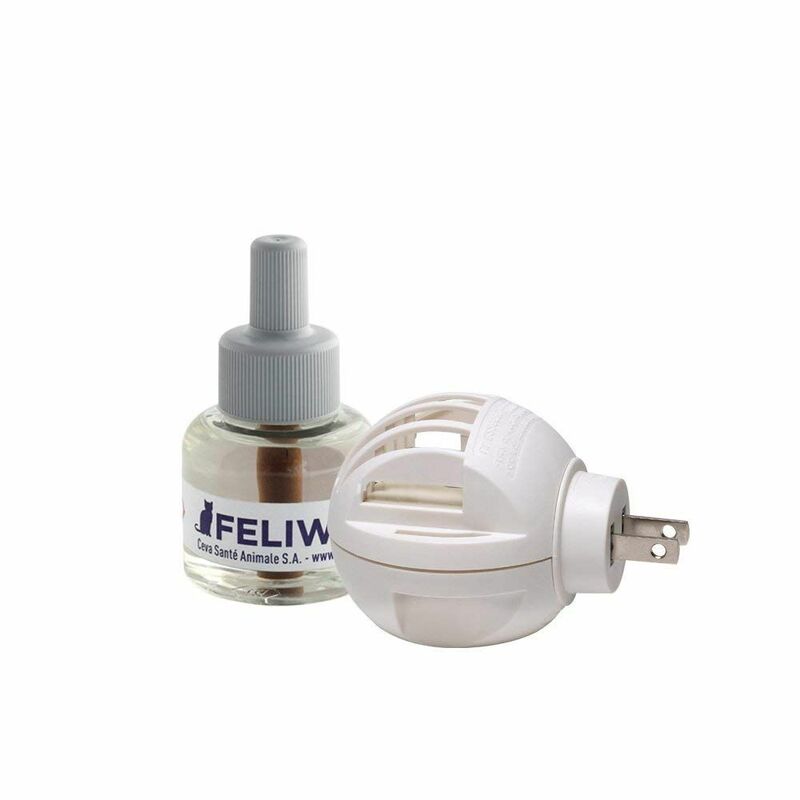 Use FELIWAY CLASSIC Starter Kit if your cat shows signs of discomfort like peeing outside the litter box, hiding, or destructive scratching. 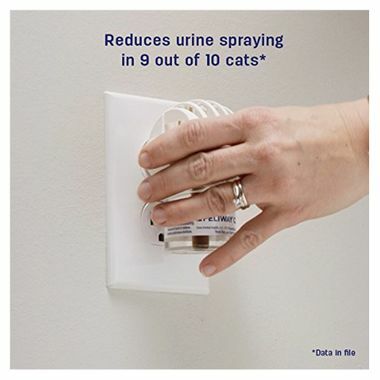 Reduces urine spraying in 9/10 cats. Can see results within 7 days. You may also consider if you anticipate changes in your home (moving, renovation, redecorating, arrival of a new pet, arrival of a new family member). Use the diffuser in the room where your cat spends the most time. Plug the diffuser in an electric socket with a minimum clear distance above the diffuser of 5 ft. (The vapor carrying the FELIWAY messages rises in a column of warm air above the diffuser). One diffuser covers up to 700 sq. ft. You may need to use more than one diffuser for a large or multi-floor home. Be sure to replace your diffuser every 6 months and refill vials every 4 weeks. It is recommended to replace the refill every 4 weeks, even if a small amount of liquid remains in the vial (the vial will never be completely empty). 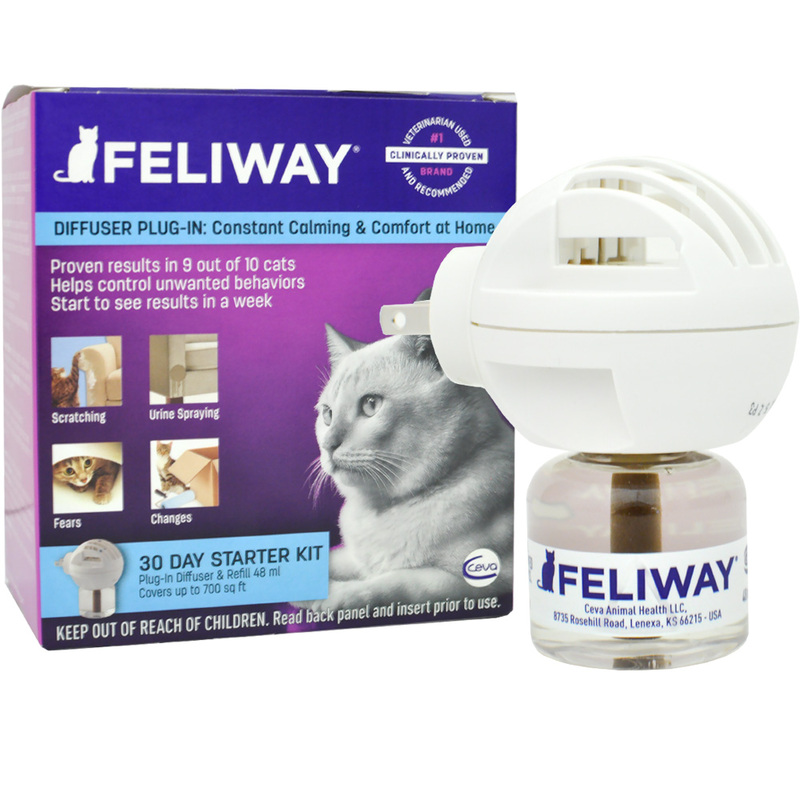 FELIWAY CLASSIC Starter Kit includes one diffuser head that lasts up to 6 months and one vial that lasts up to 30 days, covering an area up to 700 sq. ft.
Should I unplug Feliway diffuser at night? No -- the diffuser should be plugged in continuously day and night. Frequent unplugging may prevent the diffuser from working properly. Efficacy was demonstrated in clinical trials with non-interrupted use of the diffuser allowing the cat to constantly perceive the pheromone’s signal. Furthermore, cats are awake and active even at nocturnal times.